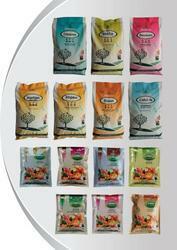 Our product range includes a wide range of water soluble fertilizer and potash fertilizers. Nowadays with a massive increase in micro irrigation technique i.e. drip irrigation system in agriculture, the use of various water soluble fertilizers is increasing tremendously. These fertilizers are very importantresource of primary nutrients viz. Nitrogen (N), Phosphorous (P)and Potassium (K). We at Agri Search are manufacturing all these fertilizers in various grades at our state of art manufacturing facility. These fertilizers are very easy to apply through drip irrigation and are very suitable for foliar spray also for quick results. These are 100 % water soluble and applied directly to plant root zones and has no harmful effects. Helps in rapid & healthy growth of crops. Recovers nutritional deficiencies in short time. Helps early & uniform flowering, prevents flower & fruit drop. Increases resistance against disease,hence reduce cost of pesticides. Ultimately Results in increased crop yield with good quality, quantity, color, taste & longer shelf life. Various grades available under our Release Series. Orthophophoric Acid 85%Phosphorous Phosphoric Acid H3PO4. Dose:- Foliar Spray :- Release WSF @ 0.5 to 1.0 Þpending upon the crop / growth stage /quantity of water used. One or two spraysare recommended in one month. Sprayingduring peak vegetative growth is morehelpful. Soil Application / Fertigation :- 25 to 75 Kg per acre depending upon crop in whole life cycle. Compatibility :-Do not use Phosphorus containing WSF with Calcium & metal (Zn, Fe, Cu, Mn ) Sulphates. 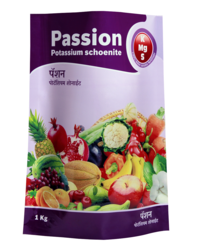 Passion is a Potassium Schoenite 100% water soluble fertilizer. Passion contains Potassium, Magnesium and Sulphur in balanced proportion. All these elements play very crucial role in plant metabolism, cell generation, energy transfer and photosynthesis. Passion regulates overall harvest from seed germination up to maturity stage. Passion enhances and strengthens growth of crops. Passion develops natural resistance in plant to overcome environmental stress. Passion regulates maturity period of crop. Passion helps in for healthy root formation.. Passion benefits in improvement of Oil, Protein, Starch and Sugar in respective Crop. Passion can be applied at fruit/ boll/ pod development stage as per recommendations. Soil Application / Fertigation :-25 Kg/ acre in split doses. Foliar Spray :- 5 to8 grams per Liter of water. Compatibility :-Passion is compatible with almost all water soluble fertilizers & micronutrients. 25Kg (Soil Application / Fertigation). Looking for WATER SOLUBLE FERTILIZERS ?